Oscar Robertson trophy: Frank Kaminsky accepts awkwardly designed trophy for Player of the Year Award. 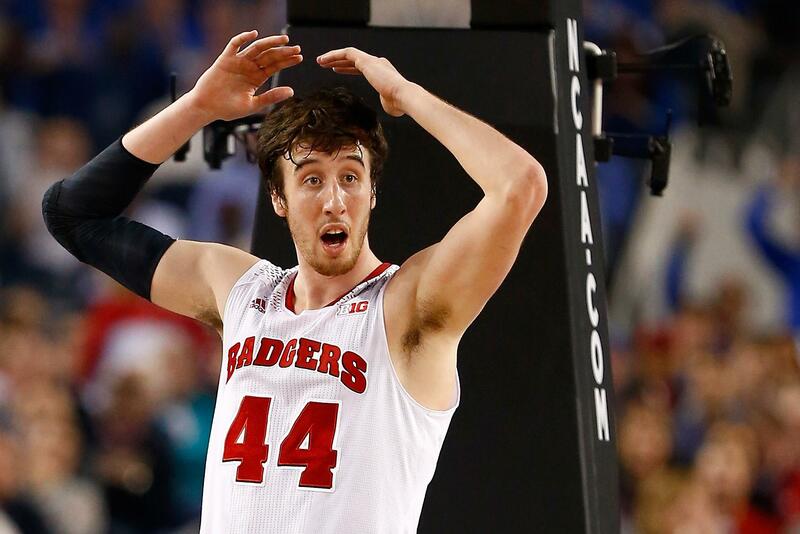 Frank Kaminsky of the University of Wisconsin, winner of possibly the most awkward trophy in sports. As part of the run-up to the Final Four in Indianapolis, the U.S. Basketball Writers’ Association held a ceremony on Friday at Lucas Oil Stadium to present its Player of the Year Award to forward Frank Kaminsky from the University of Wisconsin. Along with the prestige of the award, Kaminsky is now the proud owner of the Oscar Robertson Trophy, a prize modeled after a famous photo of the former University of Cincinnati and NBA star. Any young player would be proud to be honored with a trophy in Robertson’s image. In addition to his achievements on the court, Robertson played a leading role in changing the way professional basketball players are signed and paid in America. An anti-trust lawsuit filed in 1970 by Robertson, then president of the players’ union, eventually forced the NBA to drop many of its restrictions on free agency, giving players far greater freedom to move between teams and negotiate for higher salaries. Maybe the Basketball Writers’ Association could hold a contest next year to pick a new pose of Robertson for their statuette. There’s no shortage of great choices. But for now, congratulations to Frank!